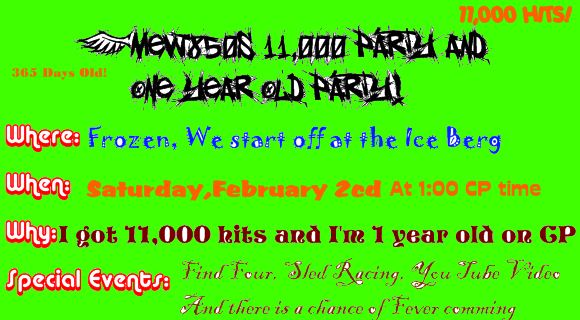 11,000 Hits party/1 Year old party! Why: I got 11,000 hits and I’m 1 year old on CP. Special Events: Find Four, Sled Racing, You tube video filming and there is a chance of Fever AKA watex to be comming to the party (50% chance). Well Hope you come! Re: 11,000 Hits party/1 Year old party! I will come to the party! Yay. 2 visitors, 10000000 to go. Lol Joking! i will come my time is set to cp's time in minites so ill make it!! I will come and ill advertise the party all over my site!! I might be busy on saturday,ill have to wait and see.